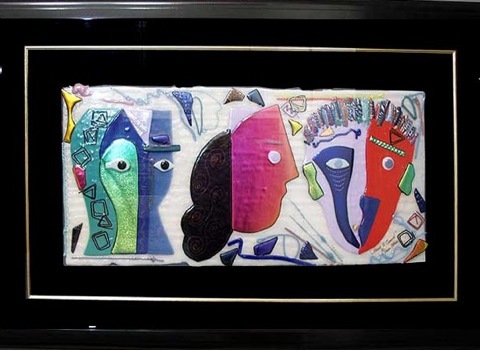 1991 saw the introduction of Shawn Athari's two dimensional art using the abstract to create imaginative wall hangings similar to more conventional art. 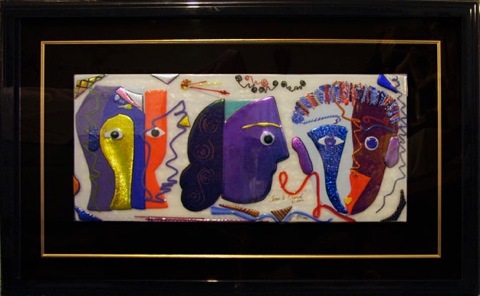 However, instead of using acrylics or oil paints all the colors are created with hundreds of pieces of hand formed glass which is then melted into each other and formed similar to Shawn Athari's three dimensional work. Three's a Crowd has a series of three distinctive faces, each with a life of its own. Size approximately 39x26x2 Comes with a white or black lacquer frame and liner. Background of piece is irridized white with various other colors.